Part of the Dallas-Fort Worth Metroplex, Irving Texas is home to many international companies such as Exxon Mobile and Kimberly Clark. Irving also hosts part of the Dallas-Fort Worth international airport within the city limits. The North American headquarters of Nokia and BlackBerry are also located in Irving, giving the economy and international boost. Several other large businesses have important branches located in Irving, Texas including the Zale Corporation and Chuck E. Cheese. The banking and insurance industries are represented by Citigroup as well as All State. A growing economy engenders intense competition and a professionally designed web site can make or break the rapid expansion of any given business. A growing population of Americans are relying on the internet for both their preferred shopping and buying experiences. If you don’t have a mobile responsive and engaging, custom designed ecommerce website built by professionals like those at Thought Media, you can easily lose business to your competition who does. Ecommerce features are a must for any business trying to compete in the Irving economy and will easily convert viewers into loyal customers. 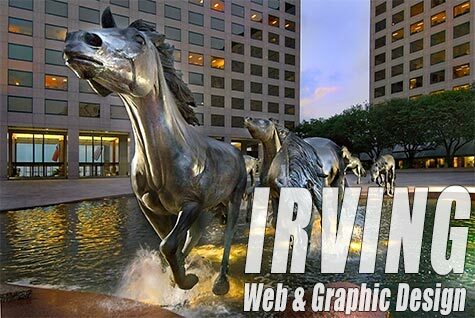 Take advantage of Irving’s growing economy with an engaging web design by the experts at Thought Media. Communicate quickly with your potential and established consumers by visually summarizing the essence of your business, brand, or message into a single logo or graphic. Effective logo and graphic design takes a unique set of skills and expertise which the graphic designers at Thought Media have. As an International company, we have our fingers on the pulse of what international consumers want. Our experience with our worldwide clientele, give us the skill and insight to help your business take advantage of both the local and the global market.